- Throughput: 30-35 persons a minute/app. Jail , Subway Station, Safety control access, Hoverport, Tourism , Sports, Exihibition, Swimming hall, Residence area, Enterprise's entry & exit, Gateway guard, Charge management, Special access control, etc. 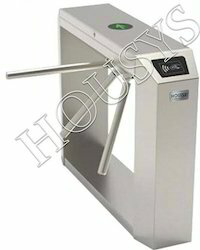 Motorized swing turnstile; elegant, smooth, quiet; advantages that make it particularly suitable for the realization of access points to hotels, spas, gyms, banks, exhibition centers. The Optical Turnstile is a Cutting Edge solution that provides a combination of reliable mechanical as well as electronic restriction for unauthorized Entrants. A Time and Attendance Reader can be integrated for Employee attendance programs. The true character of a turnstile, shows up when there’s a power outage. People wish to get out, but the turnstile won’t budge. It’s locked, and till the power returns, there’s no go. This causes panic. And that seems to be the manager’s biggest grouse when buying turnstiles.